We had a wonderful holiday and I’m so happy Valentine’s Day is falling on the weekends right now so we get to spend it with Hailey! My husband and I celebrated on Thursday knowing the weekend festivities would be mostly focused on Hailey. We wanted to save a little money this year and my husband had the great idea of recreating some memories from our honeymoon in Jamaica at home, love it! To start, he had yummy seafood appetizers ready for me when I got home from work that day! We cooked dinner together making Caribbean Jerk chicken and cilantro lime rice; every afternoon at the resort in Jamaica a cook would wheel out his grill near the pool and cook fresh jerk chicken on the spot; it smelled and tasted SO good and you can trust we ate some every day we were there! After that, we reminisced over our favorite honeymoon memories and watched Fool’s Gold, because it was the most fitting movie we could find to go with the theme of our night! It was a really fun evening and I like that we made Valentine’s Day about doing something creative together rather than buying impressive gifts. 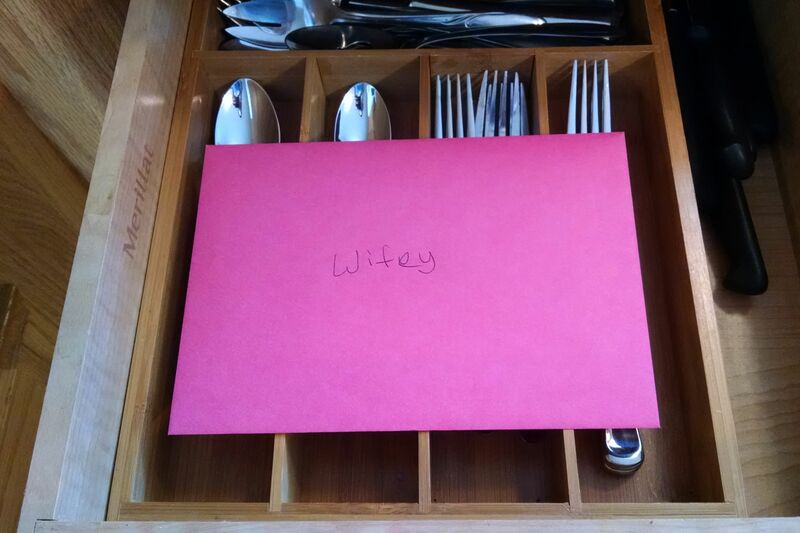 My husband even won extra points the next day when I unexpectedly found a card in the silverware drawer; I love sweet little surprises like this! Valentine’s Day…with Hailey, my goal is always to make these days extra special for her! 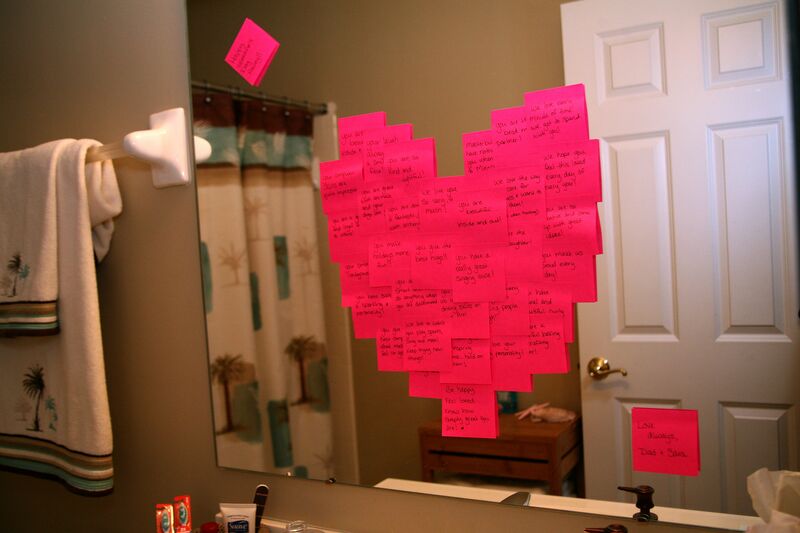 A few months ago I ran across a cute idea of creating a heart on the bathroom mirror using post-its and filling them with compliments and words of encouragement. I knew this would be easy to pull off in the morning before Hailey got up, because the girl likes to sleep in! Helping even more, she had two friends spend the night and I think we can all assume they made it to sleep just a bit later than usual 🙂 I did a mix of funny and serious notes in hopes that she would laugh, smile and truly absorb some important words….and just feel really good about herself! The end result, she loved it! I’m writing this post a day later and those post-its are still on her mirror! Next on the agenda was breakfast! One food Hailey loves is bacon; I think she’d eat it at every meal if we let her! I saw a great idea to cut bacon in half, shape it into a heart and bake it in the oven. For me, this was easier said than done. I’m not sure my bacon really resembled a heart that well, but at least the toast was cute! Most importantly, Hailey and her friends thought it was all terrific so I chalk it up to a win! 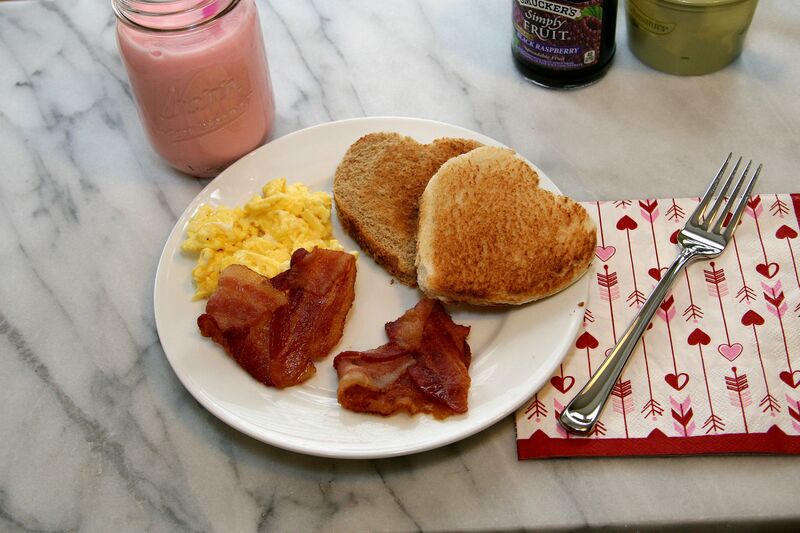 The complete meal consisted of scrambled eggs, heart shaped bacon and toast and pink (strawberry) milk! Once her friends left to go home, we decided not to delay the gift giving any longer. Something great about Hailey is how appreciative she is for everything. She loved every single part of her gift and thanked and hugged me numerous times! Between the post-its, breakfast, gifts and playing computer games with her Dad she said it was the best Valentine’s day ever at least three times before noon! Her reason for saying this though? She said it was the best one because she got to spend it with us; she is really good at melting our hearts! 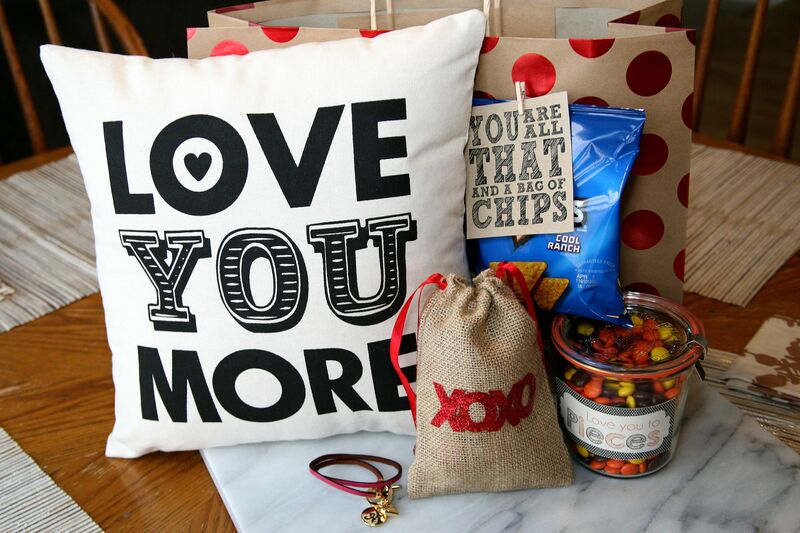 To get more details on her gift, check out my previous post Free Printables for your valentines Day gift! She loved the pillow, but the bracelet was her favorite! Hailey has gotten into archery and is doing quite well with it so our plan for the afternoon was to go to the archery range for some practice! This quickly changed after we ventured out to pick up our dog, Dusty, from the groomer’s. They were calling for a little snow, but we didn’t realize that would be paired with gusty winds and result in white outs on the road! Luckily, the vet’s office is fairly close to our house; our top speed on the way there was right around 10 mph! One of those random memories you’ll never forget from the day, you know “remember that trip to get Dusty when there was snow everywhere and we couldn’t see around us!” It was kind of like driving in a snow globe, which sounds more fun than it is! Anyway, since this is a lovely 3 day weekend the archery range got postponed until Monday and the afternoon consisted of family time and playing with friends, just as good! My dinner idea is very simple and really fun for kids! First, I look at what can be made into the shape of a heart! For this meal it was salad toppings and a side of fruit! Then, what can I color to be festive? Pasta! 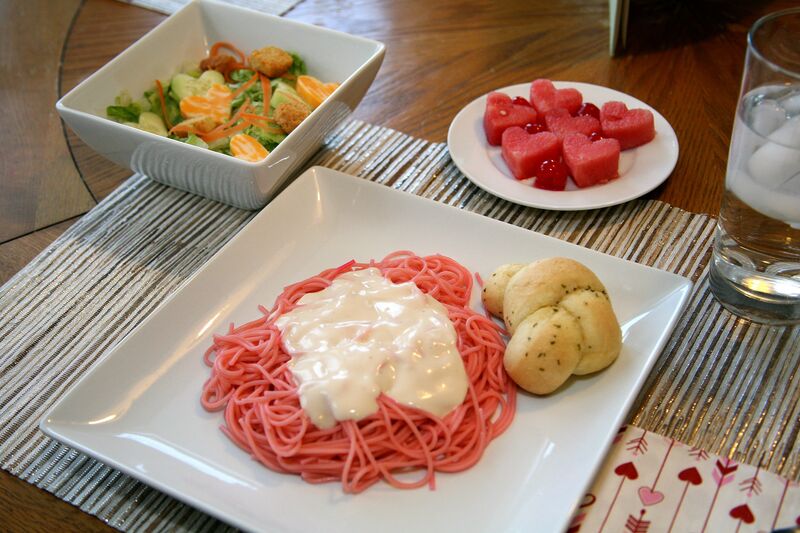 I made pink pasta with Alfredo sauce, garlic bread, salad and fruit! Another favorite of Hailey’s (in addition to bacon) is maraschino cherries! I incorporated them with the fruit dish and must say they looked pretty cute between the heart shaped watermelon! I did ask her what she wanted for Valentine’s dinner the week before and her response was “bacon and cherries!” so at least she got both of her requested items during the day! If you haven’t colored pasta before, it’s very easy! You just add food coloring to the boiling water and stir the pasta well to absorb! We ended our holiday with a movie at home and rented ‘Alexander and the Terrible, Horrible, No Good, Very Bad Day’ (yes I had to Google that just now to write the correct title!). On paper it doesn’t sound like a great movie for Valentine’s day, but like all Disney movies it ends on a really sweet note with family coming together and turning a bad day into a great one! It was a cute movie and a nice, relaxing ending to the day! Hope you all had a great holiday! !